MSRP - $135,600. dealer quote - $125k. But just found out the owner of the dealership drove it as his personal car for 2k miles. Never been titled though. Finally - in 2 years lets say I sell. How will this car with all these options hold it's value say to compared to a $110k MSRP car bought for maybe $105k? Barely any extra at all or proportionate to the sticker? I would think somewhere in the middle of barely any extra at all and proportionate to the sticker. Thanks, so maybe 25% of the option costs I'll get back? I think it is hard to pinpoint it that specifically. You will get some value. Your car would sell for more than a car with significantly less options. Also, this happens all the time, but I think it is absurd that dealers think they can drive a car for 2,000 miles and then sell it as a new car because it has never been titled. Remember, in December there is a MB Corporate $4,000 incentive on all new 2015 S class cars so take that into consideration when they quote you prices. Last edited by LovinMercedes; 12-06-2014 at 11:39 AM. If a car with 2000 miles was purchased in Pennsylvania, it would have to be marked as a used vehicle on the title. Used motor vehicle—A motor vehicle which has been sold, bargained, exchanged or given away; which has had title transferred from the person who first acquired it from the manufacturer or dealer; or which has an odometer reading of 500 miles or more, not including mileage incurred in delivery from the manufacturer or in transporting the vehicle between dealers for sale. A description of the purchased vehicle as either ‘‘new’’ or ‘‘used’’ and, if used, a brief description of its prior usage such as ‘‘executive,’’ ‘‘demonstrator,’’ ‘‘reconstructed,’’ or any prior usage which is required to be noted on a Pennsylvania Certificate of Title or which appears on the title of any state through which the dealer has acquired ownership. Last edited by MTrauman; 12-06-2014 at 12:22 PM. It's not in PA. He said it's never been titled and warranty will start at current miles and titled as new. So I guess similar to a demo. But I'll take a hit on those additional miles when I sell. I think you may be over analyzing this. I doubt the 2,000 miles will affect your value at the end of two years. The issue is that this car has been driven for 2000 miles so you are not buying a new car no matter what they tell you, how they title it, or what warranty they give to you. This may all be acceptable to you, but I think the price needs to reflect the fact that it is a used car, not a new car. This, along with the $4,000 incentive by MB in December, should guide you on what price is acceptable. Last edited by LovinMercedes; 12-06-2014 at 12:52 PM. Haha I over analyze everything! The $4000 incentive is that off the purchase price? What would be a good price to pay for this car then? I know that problem very well. I have lots of experience with it. The $4,000 if off the purchase price. I am not sure what it is worth, because I have not dealt with used cars or demos. Maybe others can chime in on the value, but I don't think the $10,000 sounds like enough. You're probably right thank you. I'm going to look at this and an s63. If I end up liking this one I need to work more on price. And if not there's a million others out there..at least I'll try to remember that as I drool haha. Depending on your local market, on a new car with 0 miles (or delivery miles <25), you should be able to negotiate atleast 5.5% or around $7500 plus $4000 or a total of $11,500 on a car with that MSRP. Now as far as a car with 2000 miles, the dealer will want to sell it as new so this will be hard but I would negotiate another $5,000 for the use of the car--good luck since this may be a very hard "fight". You might be able to get another $2,000 off realistically instead of the $5,000. But then again, the dealer may just say no and wait for the next guy who wants "that" particular car. Just depends on the local market and how hungry the dealer is to sell the car. Another thing to think about--maybe the car with 2000 miles does not qualify for the $4000 incentive since it has 2000 miles on it. I would think this dealer had to list it as a demo car for the dealership owner to drive it since this is standard practice based on the "floor planning" or financing of dealership inventory. 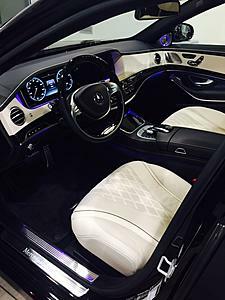 This may depend on the arrangements the dealer has with its floor plan financing arrangement either through MB Financial or another financial institution. Splitview:: only if your wife is a passenger and watches lots of movies. Driver assistance:: Its a nice feature, but annoying at times. Last edited by verdegallardo; 12-06-2014 at 06:17 PM. Turns out as I was about to sign for a whole different car the other dealer called back after I told them no because of the miles that he can't knock $5k more off but will knock $2500 more off. It prompted me to at least look at it. So I went to see it and omg the porcelain and black interior is gorgeous. So look at that it all worked out. Posting on here saved me $2500!! Now your talking!! It is simply going to come down to what car you really want since the dealer is willing to deal. You might always get a better deal but eventually your going to have to make a decision. Glad I could help some. I have negotiated S Class deals all over the country but have been partial to my local dealer over most of the 18 years in purchasing S Class cars. So hopefully you can get what you want at the price point that is a win-win for you and the dealer. Because remember the dealer does have to make money but BE A HARD NEGOTIATOR! Oh by the way my fee for helping is $2500 ! Glad I could help just a bit. Now the real payment is you have to post pictures of your new car when you get it. Last edited by MTrauman; 12-06-2014 at 07:59 PM. I think you have to ask yourself if you want or even LIKE all of this equipment & colors. If you don't like an option or will never use it, it's a total waste of money. I, personally, wouldn't have this car at any reasonable price, because I don't like it and I feel that ones car should be as close to your exact desires as possible. If you are not in love with this car, keep shopping. Or, better yet, place a special order and get exactly what you want and know, every time you get behind the wheel, that this car was made just for you! P.S. If you were ever in the military, even the reserves, you can join USAA for free and get a certificate for FORTY-FIVE HUNDRED DOLLARS off a new S550 in December! Forward, HO! So many of us on the forum like to order our cars, just the way we want them. In the US, of all buyers, 90 percent of the cars are bought off the lot. Only 10% are ordered. In Europe, it is exactly the opposite. After 55+ new cars, I still can never seem to determine just WHEN the dealer is still making a profit and I don't really think anyone here, who isn't at the moment employed by MB, really does know. With all of the secret discounts, incentives, advertising allowances, kickbacks, holdbacks, quarterbacks, running backs and TAKEBACKS, how can anyone really know for sure? I guess when they actually let you drive away in your OLD car, you know--but still, not really. In case you were never a part of the military (like 80-90%) of the rest of us, MBUSA's winter incentive is 4K on the '15 S class. Well, after six months of basic training at Ft. Ord, for the next seven years, I went to my monthly drills with my National Guard unit. Every summer, I spent two weeks--in JULY--in Death Valley, where it was over 120 degrees most days. And, all the time, I worried about my unit being called to active duty, which, thankfully never happened. After all these years, it's nice to get a perk or two in return. Pic attached, just so beautiful! The Histrionic Plus with steering assist is absolutely worth gold. Had a 4 hour drive home last night and even at night it performed like a champ. Combine that with night vision, massaging seats, and 3D audio I was riding home in a cloud!! Regarding ordering - the only car Ive ever ordered is my Tesla just because you have to. I hate waiting and normally don't keep cars more than 2 years or so. Now the question will be whether I keep or sell the Tesla after driving this! Quick Reply: Are these options worth it? And price?